This article has been published collaboratively with eatbreathegarden and Michigan Horticultural Therapy Association’s People-Plant Interactions. Authors Lesley Fleming, HTR, and Kathy Carroll, HTR, have previously written articles together, sharing a common philosophy of the power of plants and the role of horticultural therapy in health and wellness. 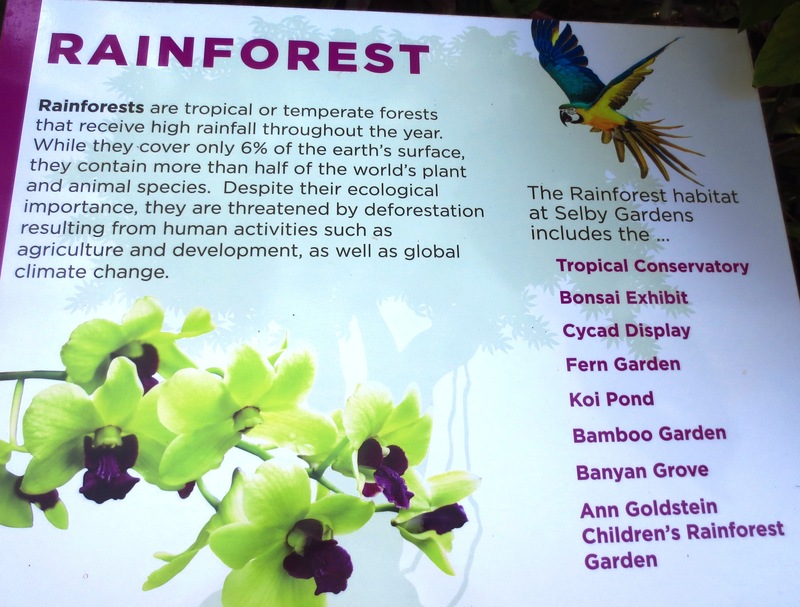 Intended to welcome visitors of all ages and abilities, the Anne Goldstein Children’s Rainforest Garden at Marie Selby Botanical Gardens is a visual and experiential delight. Like other public gardens including Dallas Arboretum, Naples Botanical Garden, and Ringling Museum, the addition of children’s gardens in the last five years reflects a trend signaling an interest in attracting a younger/family demographic. A 2015 study determined that 55% of 163 public gardens [investigated] included a children’s garden and an additional 26.4% planned to add a children’s garden in the near future (Kwon, 2015). The design of gardens, specifically children’s gardens, seek to offer “people plant connections…to provide the richest experience” using all five senses, according to landscape designer Mark Kosmos (2013). More than merely a visual experience, he suggests that “integrating opportunities for tactile, olfactory, auditory, and taste provide a more memorable experience.” Embracing this multi-sensory and interactive construct, Selby’s Children’s Rainforest Garden has been able to successfully integrate accessible features in a manner that is creative, safe, and appealing to a broad spectrum of visitors. Universal design principles and ADA (Americans with Disabilities Act) regulations guided the garden’s accessibility plan. 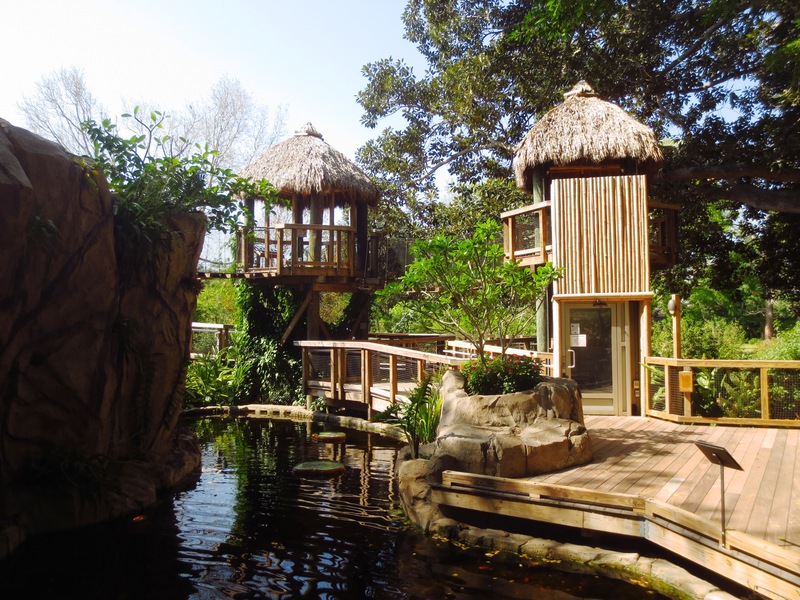 Without drawing attention to who or how accessible features are used, experiences within the entire garden including its tree house, epiphyte canyon, 12 ft. waterfall, and multiple play areas are inviting, whimsical, safe, and inclusive. The garden’s thoughtful design has reduced physical and psychological barriers. Entering the Children’s Rainforest Garden from the paved path of the main garden, the transom seamlessly joins the children’s garden path, made of composite materials, reducing any potential tripping hazard. 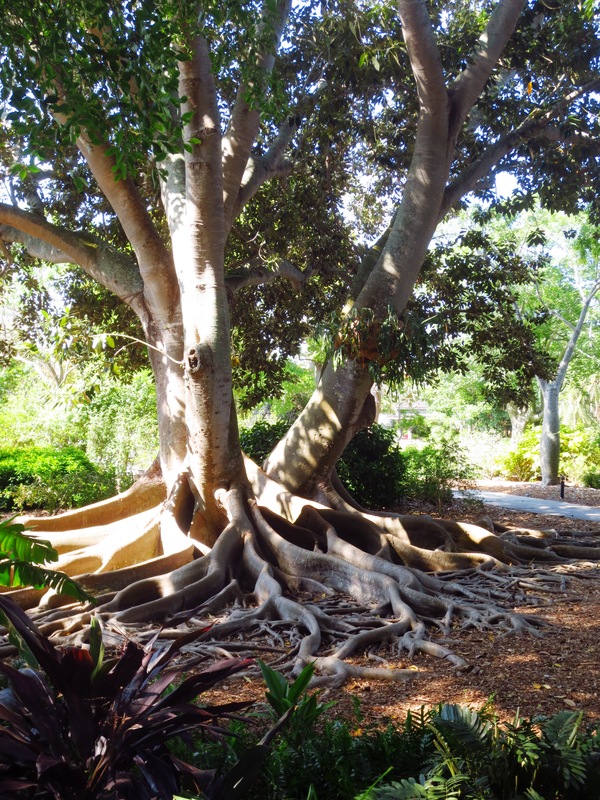 It also eases any physical challenge of navigating the slight grade of the elevated 9 ft. wide path that encircles the banyan grove’s aerial roots. Raised toe rails prevent anyone or anything (stroller, wheelchair) from falling off the path. 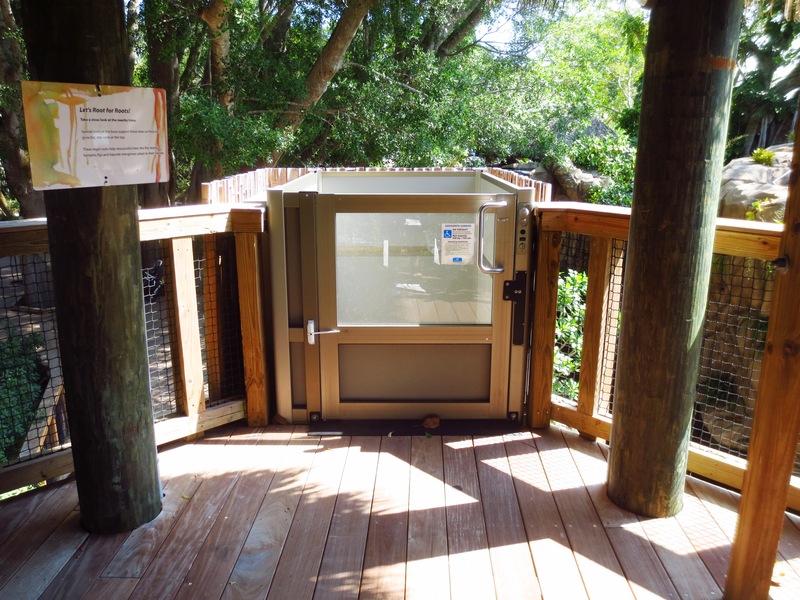 The Rainforest Garden’s single point entry and exit reassures adult companions that children can explore with some degree of independence, and cannot leave without being seen. 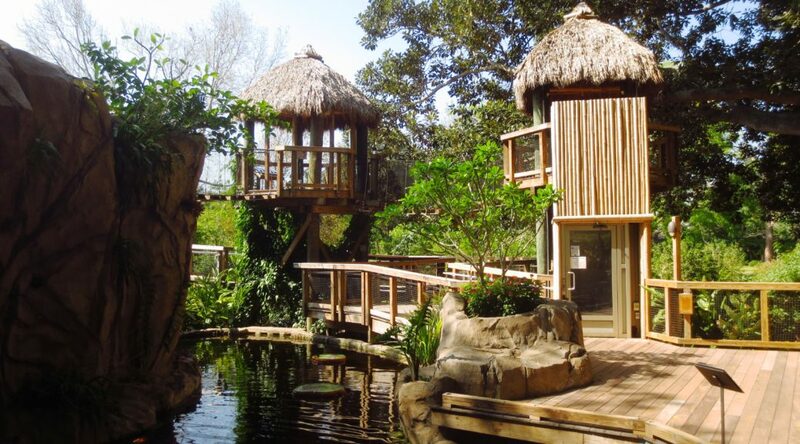 The entrance’s sight line reveals a two story tree house, drawing visitors into the tropical oasis. Choices abound. 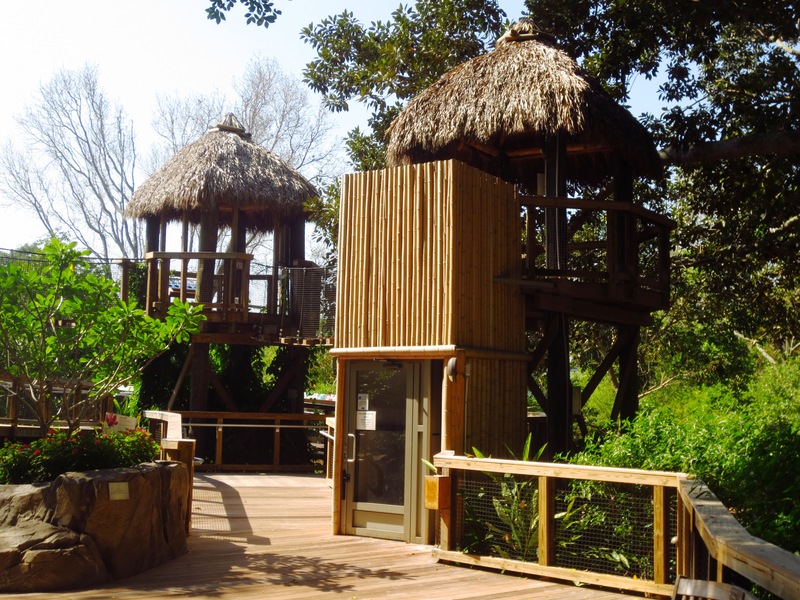 An outdoor elevator is cleverly incorporated into the tree house structure (key available at three locations close by) or alternately a winding graded path with non-slip surface and handrails leads up to the canopy treetop level. Once up top, two swinging bridges afford a bird’s eye view of the surroundings as do adjacent platforms. Safety netting, handrails, and width sufficient for parent and child to move side by side across the bridges provide an exhilarating experience. People in wheelchairs would find this garden feature not as accessible; steps onto the bridge and the bridge’s path surface would be difficult to maneuver. 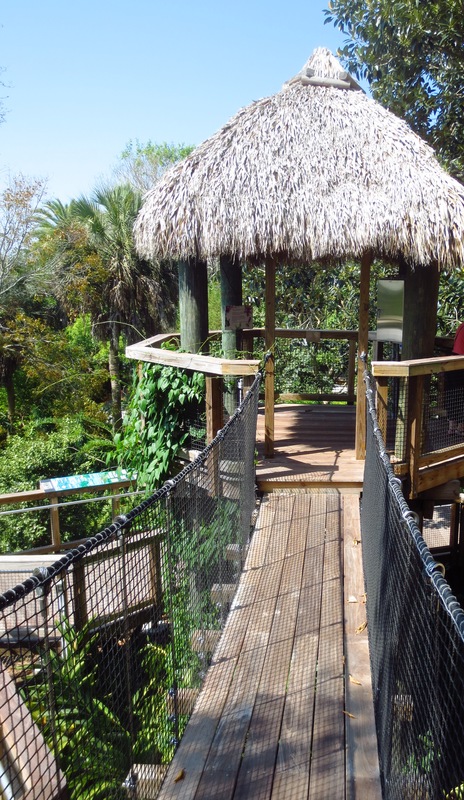 For those with other physical challenges like sight or hearing impairment, autism, balance, or strength issues, these swinging bridges afford challenges that test and reward one’s sense of adventure and willingness to overcome trepidation. Offered as an alternative to the swinging bridges, a round-shaped swing is available in the grassy play area at ground level. 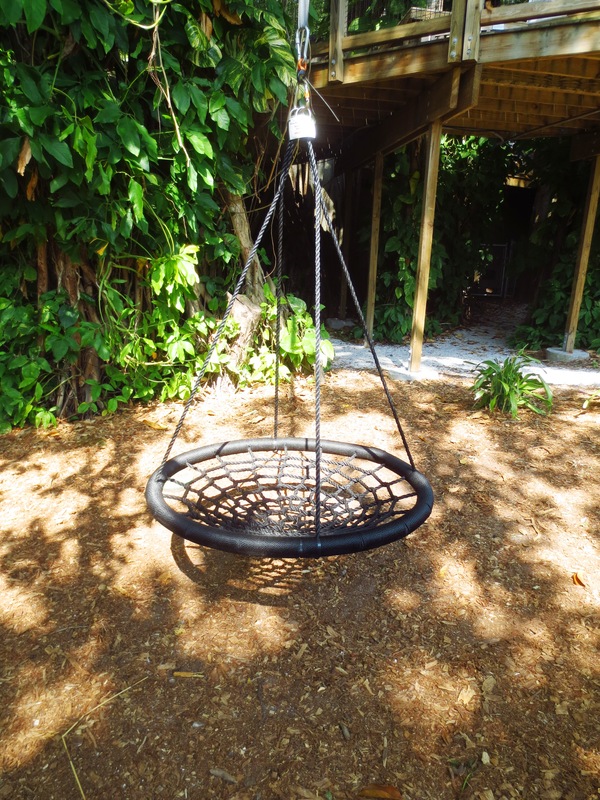 Suitable for those with mobility or sitting challenges, the netted swing can accommodate one or more, in both seated and prone positions, providing the thrill of swinging, motion, and bilateral movement, the latter often a focus of physical therapy. 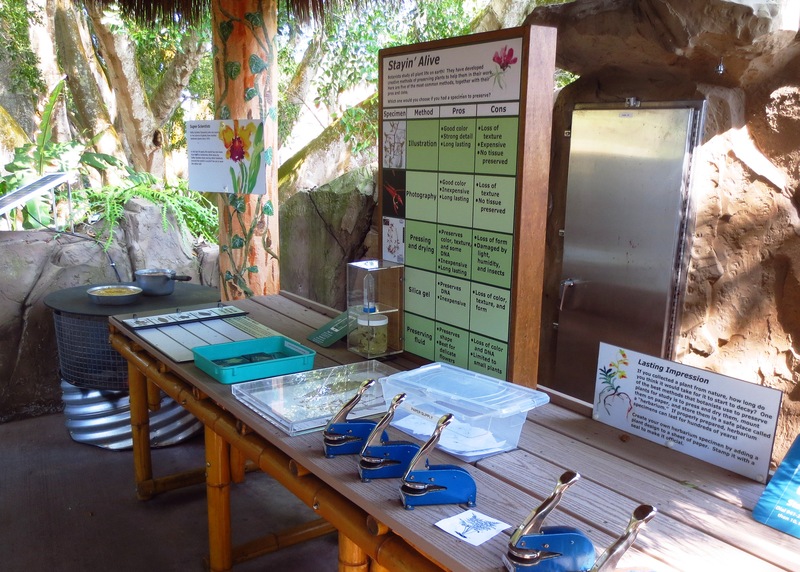 Nature-based hands-on activities like plant stampings, swinging hammocks in the research camp, and large piece puzzles challenge visitors to think, reason, or have imaginative playtime. Regularly scheduled programmed activities supplement the free play of the garden. For days when temperature and humidity are high, the garden offers a nearby indoor play space stocked with nature-based activities: flower shaped puzzles, building blocks, plant stencils, dress-up clothing, and more. Used throughout the year regardless of temperature, this indoor space extends the playability of the garden and is often a welcome respite for families with multiple children, especially babies. The creative use of sensory stimulation provides a different type of accessibility in the garden — the psychological feeling that there are no barriers — the “I can do this experience.” Hearing the sound of musical instruments (xylophone) or roar of the waterfall, feeling the rough texture of the canyon walls or the fine mist sprayed on visitors, smelling the fragrance of trees and plants, looking at rainforest food plants — bananas, pineapple, papayas, as well as seasonal edibles in raised beds, climbing on the massive buttress roots of the Moreton Bay Fig broaden the garden experience. The mission statement — “To create a Children’s Rainforest Garden at Selby Gardens that is a safe, natural place for young children and their families to develop a life-long appreciation for the living world through outdoor play, discovery, and learning” — incorporates the accessibility strategy alongside the educational/environmental framework. 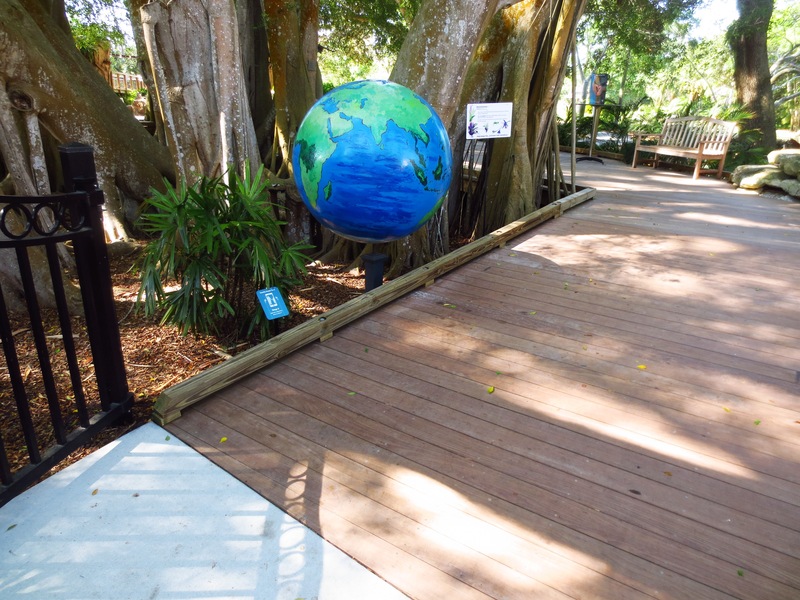 There are a few limitations to accessibility in the Children’s Rainforest Garden. Some areas are not fully accessible by those with mobility challenges; the swinging bridges, the multi-tiered steps that double as an outdoor theater, and a short ground-level path under the sloped upper path (too low hanging for most adults and the path’s surface is difficult to navigate for wheelchairs, walkers or strollers). 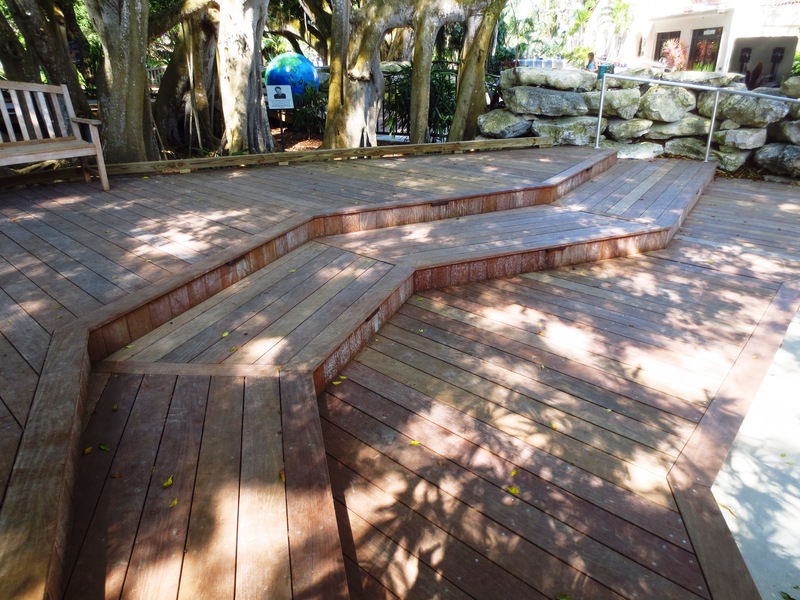 Alternate options are adjacent to the tiered step/theater area and the path under the path. Braille signage and audio signals, available at many gardens, are not currently available. 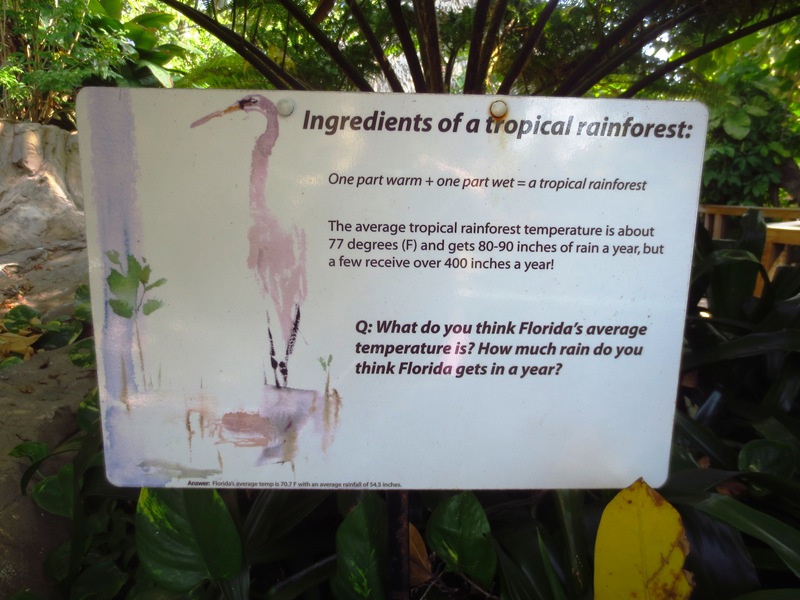 The Children’s Rainforest Garden has been successful in attracting a younger demographic who seem delighted to play, look, and explore in this little part of the larger garden. Selby’s ability to provide an accessible children’s garden space is commendable, particularly using the more current definition of accessibility– “usable by people with the widest possible range of abilities, operating within the widest range of situations for people with or without disabilities”. The genius of the Children’s Rainforest Garden is its ability to offer inclusive experiences to all visitors, blending its accessible features into a beautiful, playful garden setting. Cooper Marcus, C. & Sachs, N. (2014). Children’s Hospital Gardens. Therapeutic Landscapes An Evidence-Based Approach to Designing Healing Gardens and Restorative Outdoor Spaces. Hoboken, New Jersey: Wiley and & Sons. Kosmos, M., & Bell, M. (2013). Distilling the Essence of Children’s Garden Design. AHTA News Magazine. 41(2). This article has been published collaboratively with Eatbreathegarden.com and Michigan Horticultural Therapy Association’s People-Plant Interactions. Authors Lesley Fleming, HTR and Kathy Carroll, HTR have previously written articles together, sharing a common philosophy of the power of plants and the role of horticultural therapy in health and wellness.